Today’s in my Kitchen…Home made sun dried Papad. Urad dal, also known as Split Black Gram, is one of the famous lentils used in southern part of Asia, especially in Indian cuisine. Rich in protein, fat and carbo, vitamins uurad dal is loads of health benefits. This simple lentil is full of iron, folic acid, and manymore. This Urad Papad is healthy touch to our Daily Meal. 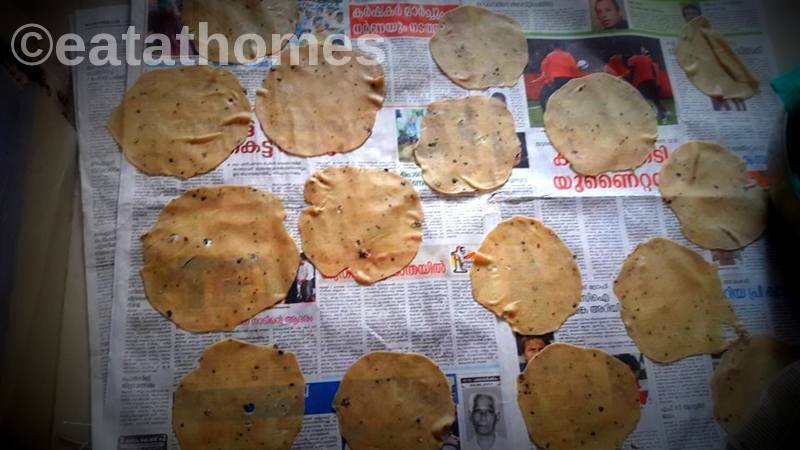 Homemade Papad need lot of hard work , But end result is just amazing. 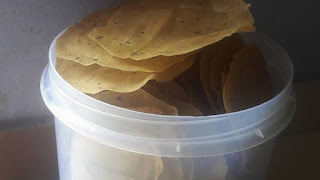 This home made papad very crispy, crunchy, so tasty with goodness of Nutritious Urad dal. Why not try this year homemade papad FOR 12 MONTH STOCK!! friends lets start to make Urad Dal Papad / Pappadam. Take water into a sauce pan. Add Ram bandhu papad masala (राम बंधू ). Mix well and bring it to boil. Masala should completely dissolve in the water. When water boils, turn off the gas and let the mixture cool down completely. Take urad dal into a dish and add Crushed pepper. Mix well and add water. Make thick dough. Urad dal being sticky, dough will stick to your hand. You can use oil while kneading. Take dry flour and clean your hand and dish with it. Use water at the intervals and knead the dough. Add a little oil and knead the dough again. You can use mortar and pound (पाटा-वरवंटा ) to punch the dough. Rub a little oil to your hand and take that much dough that fits into your hand. Stretch the dough using both hands. Stretch the dough for 7-8 minutes and make it soft and uniform. The more you stretch, papad will be better. Roll the dough into smooth even elongated shape. Cut lati with help of knife form that dough. You can make lati of your required size small or big. Transfer the lati into a bowl, cover and keep aside. Take one lati and roll papad. Roll it thin and nice. You can use dry flour or oil if required. But if you and kneaded the dough really good, then oil or dry flour is not at all required. Transfer the rolled papad on a Paper or cotton cloth and sundry them. Dry under hot sun for about 2-3 hours and flip over. Dry from another side as well. 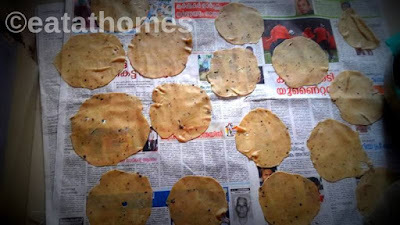 It takes about 1-2 days for drying the papad. sprinkle some chat masala , salt & chili powder. You can either fry or roast the papad and serve with Dal Rice, bhaji – chapati also u can make chutney powder from this papads. You can Change papad flavour like Mirchi-lasun papad, corriender leaf or plain papad according to your taste. Keep balance dough more than 3 month in freeze. Above same recipe u can make Moong dal or Urad dal or any lentils Papad. surely you will enjoy every meal with this papad munchies….